Bitcoin XT was a fork of Bitcoin Core created by Mike Hearn in 2014. Originally designed to introduce alternative P2P rules, it later gained significant notoriety and support after its adoption of BIP 101 without community support in 2015, giving it importance in the block size limit controversy. After Andresen's resignation from the position of Bitcoin Core maintainer, he and Mike Hearn organized Bitcoin XT to address several controversial ideas lacking the consensus required to be implemented in Bitcoin Core. 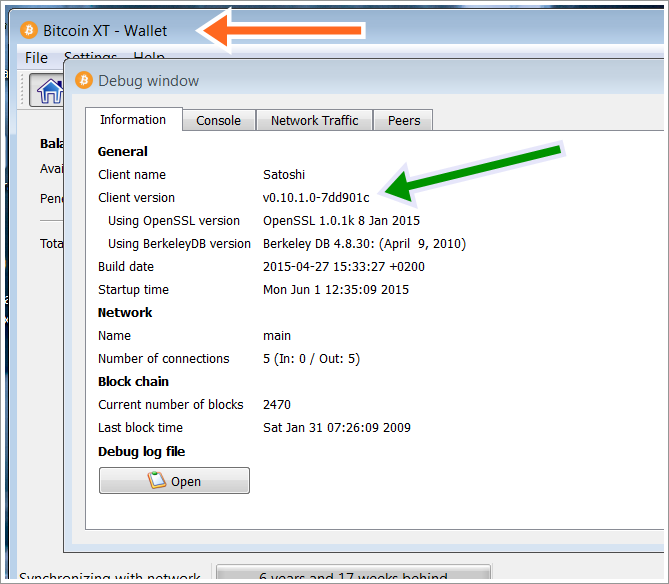 BIP 101 was implemented in Bitcoin XT on August 6, 2015 and released on August 15. If 75% of the last 1000 blocks were observed to have particular version bits set, it would have ceased enforcing the 1 MB block size limit and also have added a few new rules. However, this threshold was never achieved and no new XT blocks are being created today. In January 2016, BIP 101 was removed from Bitcoin XT and replaced with the one-time block size increase to 2 MB present in Bitcoin Classic. In the year following this change, adoption of Bitcoin XT decreased dramatically, with fewer than 30 nodes remaining by January 2017. Later attempts by other codebases to increase the block size to 2 MB including Bitcoin Classic and SegWit2x have also failed. Miners that side with Bitcoin XT will produce blocks with a new version number. This indicates to the rest of the network that they support XT. When 75% of the last 1000 blocks are new-version blocks, these miners will automatically abandon Bitcoin and begin mining on a new Bitcoin XT blockchain. This will begin after a waiting period of two weeks in hopes the economy in this time may force anyone who hasn't switched yet to do so. Users and miners running full Bitcoin nodes will reject the XT blockchain starting with the first block that is larger than one megabyte in size, and thus be unaffected provided it fails to achieve economic consensus. If insufficient mining hash power runs XT to reach supermajority then nothing will happen. If enough does, XT users will follow a new blockchain and cease to be using and trading bitcoins. Later in January 2016, frustrated of his proposal being massively outvoted, Mike Hearn made a media stunt declaring on various US national and international press agencies that "Bitcoin has failed". Max Keiser quoted Bram Cohen  in describing Hearn's move as "whiny rage quitting"  and other members of the community pointed to an extensive account of manipulations http://gettopical.com/bitcoin/e289a9a5189008d994e80666e9038089 (unfortunately today many twitter screenshots are broken). ↑ organofcorti (27 August 2015). "BIP101 implementation flaws". The Neighbourhood Pool Watch. http://organofcorti.blogspot.com/2015/08/bip101-implementation-flaws.html. Retrieved 27 August 2015. ↑ Hearn, Mike (27 August 2015). "An XT FAQ". Medium. https://medium.com/@octskyward/an-xt-faq-38e78aa32ff0. Retrieved 27 August 2015. ↑ Mike Hearn. "Why is Bitcoin forking? — Faith and future". Medium. https://medium.com/@octskyward/why-is-bitcoin-forking-d647312d22c1. ↑ "Bitcoin XT Nodes Summary". coin.dance. https://coin.dance/nodes/xt. Retrieved 7 January 2017. ↑ Higgins, Stan (November 17, 2017). "No Fork, No Fire: Segwit2x Nodes Stall Running Abandoned Bitcoin Code". CoinDesk. https://www.coindesk.com/no-fork-no-fire-segwit2x-nodes-stall-running-abandoned-bitcoin-code/. Retrieved November 29, 2017. ↑ 8.0 8.1 8.2 8.3 Wilson, Fred (17 August 2015). "The Bitcoin XT Fork". AVC. http://avc.com/2015/08/the-bitcoin-xt-fork/. Retrieved 28 August 2015. This page was last edited on 3 March 2019, at 22:10.